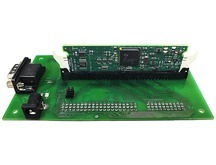 The Cross-2833x Board is an expansion board between control unit "Delfino" F2833x controlCARD manufactured by Texas Instruments and MCB Kit manufactured by "NPF Mechatronica-Pro". The Board with the control module is intended for development and debugging of software that is created for digital signal controllers "Delfino" manufactured by Texas Instruments, for example, TMS320F28335. Connector DB9 for interface RS-232 is available on the board. The board is size and pin compatible with boards mZdsp 2812, eZdsp™F2812. Using the Expansion Board without MCB Kits is feasible with other control modules of Texas Instruments "Piccolo" F28035 controlCARD, "Piccolo" F2802x controlCARD. We are waiting for your suggestions or questions!